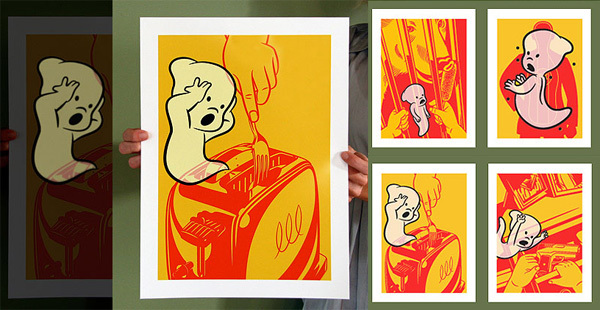 Also in the Coudal Swap Meat ~ Four glow in the dark ghost prints by Billy Davis ~ “This set of four prints was hand-screened at Crosshair Press in Chicago, and each features a glowing ghost in various ill-advised endeavors.” Adorable… yet just twisted enough. I love that space where biology meets design meets infographics… i just found this awesome set of two Lucky White Squirrel Posters by Moi Moi at Coudal’s Swap Meat Gifted! 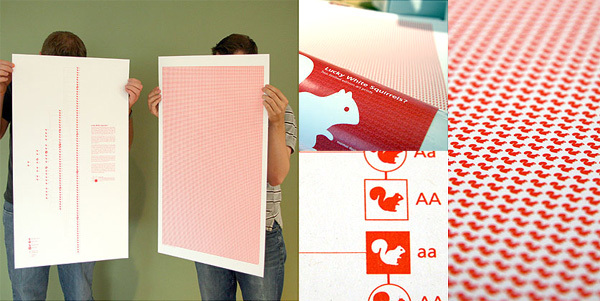 “The Lucky White Squirrels limited edition print set was originally produced as two 4’x 8’ panels for a squirrel themed art exhibition held at a Toronto gallery located across from a park where a resident population of albino squirrels live. Working with the punnet square and the network diagram this idiosyncratic info-graphic based artwork explains why seeing an albino squirrel is lucky. The first print, a network diagram, illustrates the mix of genes it would take to create albino progeny from a pair of squirrels each carrying the recessive gene for albinism. The second, in real numbers, illustrates squirrel for squirrel the 1:20,000 odds that this would occur.” Purchaseable here for $60. Click the images to find out more! Sorry i’ve been a bit quiet lately ~ the gift guides are hard! But been working all weekend to get some really fun ones ready for this week… we’re into the final 5 days today! So here’s a roundup, and i should be back to my usual posting madness in no time! Gift Guide Day 12 is illustrated and hand picked by NOTCOT contributor, Anna, of Sub-Studio! And Anna’s other half, Sean, put his incredible skills to use on the adorable frames… and the robot that is buzzing around hanging them! D-BROS is the product arm of advertising and graphic design firm, Draft Co., Ltd. 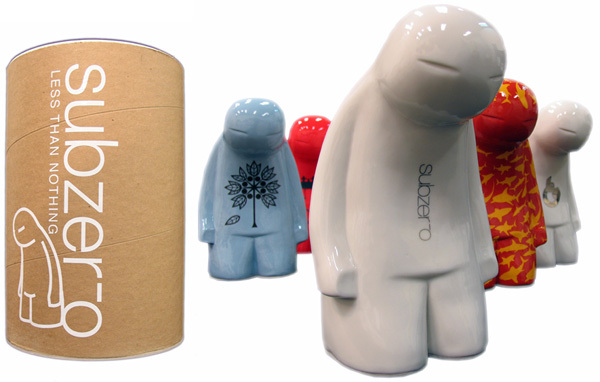 I love almost everything that comes out of D-BROS - very witty 2-D and 3-D products. 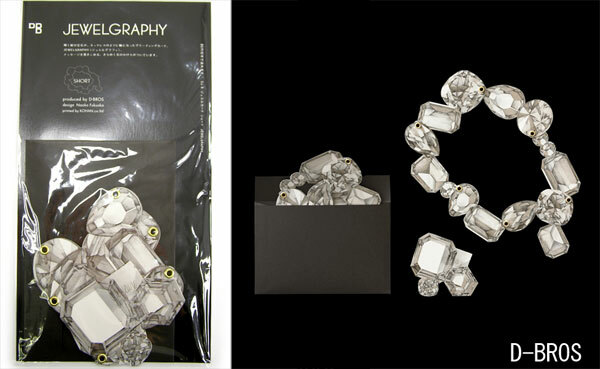 The Jewelgraphy card above would be great as a stocking stuffer (or as a card). It reminds me of the costume jewelry I used to play with as a kid, only cooler. After the jump are a few of D-BROS’ 2008 calendars. I love how actual ribbons are incorporated into the design of the Ribbon calendar. The Joy by Day by Toy calendar starts as a blank slate but comes with a pack of coded stickers that allow you to decorate it on an as needed basis. The Serif just featured these great posters for the Museum of Childhood at the V&A. Not much to say here, more just for your staring pleasure… and reminiscing. 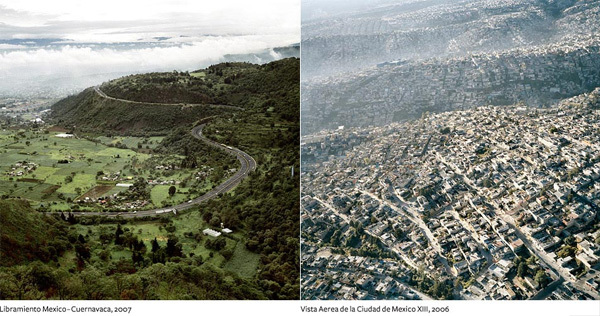 Between the overdosing of digital and physical mass consumption going on all around us this month ~ it is refreshing to see this email from Kelly about the Terrazo: Views of Mexico City photography exhibition by Pablo Lopez at the Sasha Wolf Gallery. There is something mesmerizing and calming about the perspective and detachment in these images… between all the shopping and dealing with the masses, these images certainly help you step back for a moment. Click the images to find out more! So many great designer inspirations at .org this week i couldn’t resist another roundup to help kick start your week! 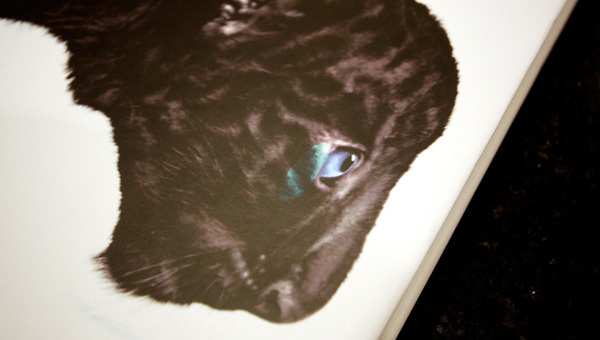 Creature by Andrew Zuckerman… i’ve been pretty obsessed with this book since the post, but been so slow and busy i hadn’t gotten around to ordering it until making the gift guides (it showed up on Day 28 and Day 21)… at which point my mom apparently took the hint and ordered it. Well good news + bad news. The book is BREATHTAKING, even more so in person with the large coffee table format. I wish i could have ordered a copy for everyone i know… truly incredible. The bad news is… she happened to order it from Powell’s (the largest independent bookstore!) instead of our usual Amazon since she had some credit to use up… and unfortunately the packing wasn’t quite up to par and being the book/product junkie that i am, its driving me absolutely mad that the corners were all bashed up, and the bottom right corner of all of the pages are buckling a bit… enough to notice when flipping through such pristine white pages… oh, and somehow this copy has it looking like the cat on the cover is crying green… So, as my random Saturday night post, just wanted to vent slightly, and let you know i’m suddenly reminded why its more satisfying to buy things in person sometimes… in brick and mortar stores… or sticking to super huge giants who take too much care in packaging for survival during the holiday season! more images of some of the awesomeness within, as well as what’s driving me crazy. Click the images to find out more! Since i am a total slacker and i decided to take the day off and drive down to LA from SF… then have more fun prepping some packages and gift cards for mailing (SO fun!) 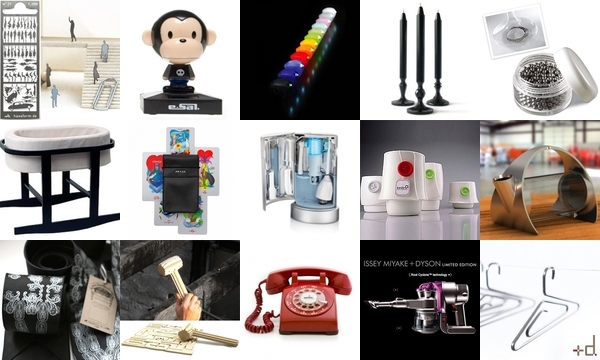 instead of scouring the internet for some posting, or actually downloading and cleaning up some photos off the dslr… in order to avoid the back to back gift guide posts, here’s a massive roundup of buy-ables from .org! First thing i will definitely need to do once tagging and better categorizing and all that classification related stuff gets sorted out - a tag for things we can buy… instant personal catalog to make gift guiding and shopping (for both me and you!) much easier. I have long admired Eric Feng’s (aka Feric) illustrations. 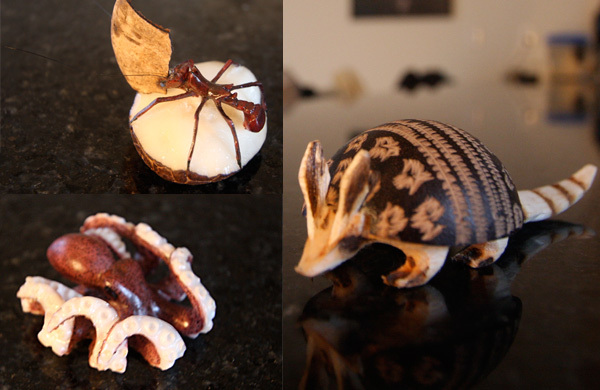 His work is gorgeous - a mixture of real and imagined and of natural and mechanical. I love the fantastical, mechanical anatomies of his characters, and how you are given a peek at what is beneath through transparent layering. Limited edition giclée prints of Feric’s work are available at his online store. 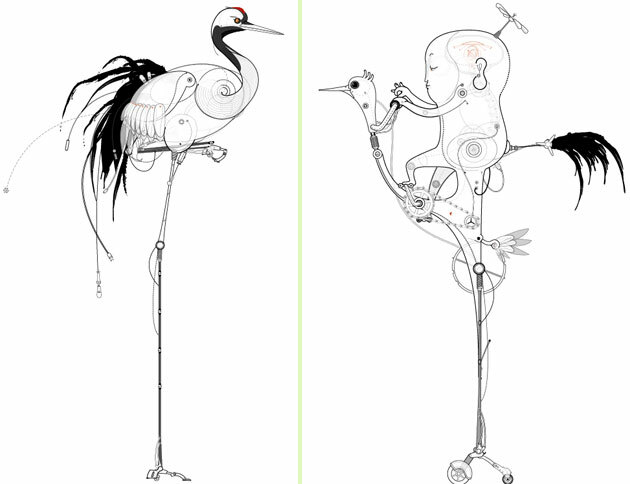 They are fairly pricey for a digital print, but I could almost be tempted because I love some of his pieces so much (“Roda. Continue” - I’m talking about you!). Worth checking out at the very least! Here’s an embarrassing thing to admit: yes, i am obsessed with great product/user experience design, but for some reason i never got totally obsessive when it came to architecture… but i LOVE going to architectural exhibitions to see what little people, trees, and cars they used, and taking super close up images of their worlds. 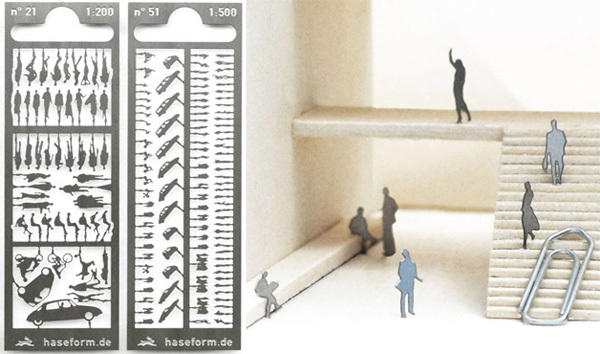 Well, continuing that 2D Ring trend, these metal silhouettes for architectural projects are just genius. I spotted these over at Modellfiguren are by Haseform. And at a mere 5 euro for a sheet, who can say no? You can buy them at modular. Behold London’s newest concept store, Wonder Room which has just opened in Selfridges department store in the heart of Oxford Street. Spontaneous, unique and entertaining this 19,000 square foot space is dedicated to luxury items. 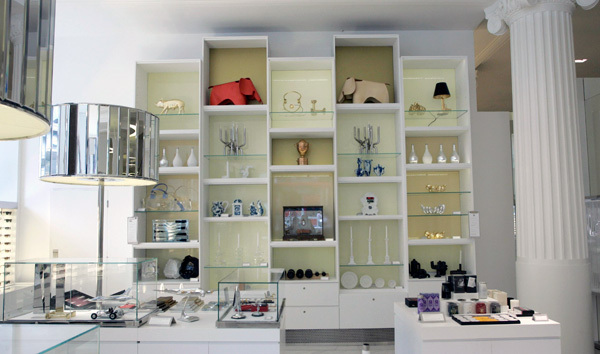 From designer AreaWare ashtrays, Bedside Gun Lamp by Philippe Starck and18 carat gold Ipods, The Wonder Room brings together exquisite products! From fine jewelery brands such as Tiffany & Co, finely crafted watches by Breitling, high fashion brands sunglasses and handbags including Chanel and Bvlgari, the rooms has a beautiful mix of high end items. Everything in this room has value, whether it being a quirky toy or an unusual book on flowers, its wide selection of products is perfect for precious gifts. And for those of you who can’t make it over yet, see more pics below! Also take a look at the podcasts section where Wanda of the Wonder Room hunts for dragons, magic beans, cats that turn into unicorns… and other Wonder Room requests of that nature.